Run the 1-2-2 match-up zone against multiple types of offenses! Zone defenses are used at all levels of basketball to help stop opposing offenses. However, few teams use zones on a consistent basis because coaches don't know how to defend a handful of key situations using a zone defense. In this video, 2006 NCAA Championship coach Brenda Frese shows you all the tactics you need to run the 1-2-2 defense. Coach Frese details how to install the 1-2-2 zone, the coverages within the zone, defending seven situations within the zone defense, as well as how to defend against three offense sets within the 1-2-2. Through the use of game film and on-court demonstration, you will see seven special situations that arise when using the 1-2-2 match-up zone. Frese teaches you how to stop a star player from receiving the ball in the match-up zone, as well as how to guard against high post flashes within the zone. Additionally, Frese explains how to guard against dribble penetration, how to stop cutting action to the weak and strong sides of the court, how to defend against ball and middle screens, how to defend against skip passes, and how to trap the corners from your 1-2-2 alignment. 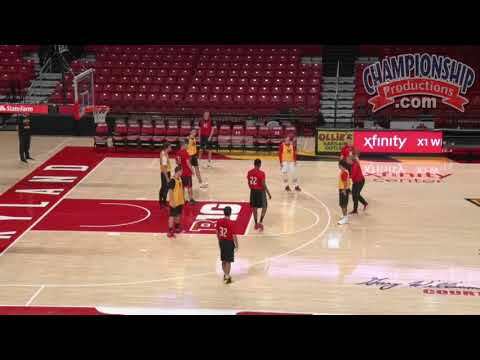 Coach Frese shows how effective the use of a 1-2-2 zone can be whether it be defending inbound situations, defending the high post or trapping in corners. Frese walks you through how to install, implement and win with a smothering 1-2-2 match-up zone!